Things are changing so quickly it’s hard to keep up. 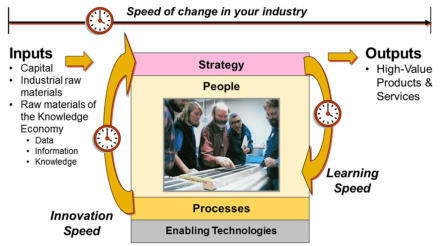 And it’s not just the speed of change that’s accelerating. The level of complexity you have to deal with is expanding as well, at an ever-increasing rate. It all boils down to this: Eventually you’ll be out of business. If you want to succeed and grow, your organization needs to change at least as fast as, or faster than, the speed of change in your industry. The Enterprise of the Future is a framework for leaders and managers to increase the speed at which people and organizations innovate and learn. It creates a platform for developing the right strategy, identifying and minimizing risk, and transforming traditional knowledge-hoarding organizations into agile knowledge enterprises. This site provides you with access to a collection of tools and best practices for helping to make this transformation happen. if your speed of change - the rate at which your organization innovates and learns - is slower than that of your industry, you’re continually falling behind in a vicious cycle.